Aloha, and welcome to Day #3 of this week's Chocolate and Coconut Series. Today's chocolate and coconut blend came in the form of Dark Chocolate Coated Coconut Chips from Maui and Sons (Malibu, CA). 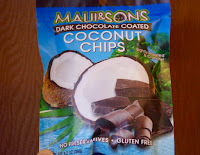 These lightly roasted and crunchy coconut chips were a product of Thailand. (One of the company's goals is to support farmers in Thailand.) A light dark chocolate coating (cane sugar, vegetable fat, cocoa powder, lecithin, vanilla flavor) added some additional richness. The gluten-free chips* were shaped in tiny rectangular strips, making them a good candidate for a topping as well as an a la carte snack.